Boost In Nuclear Health Science For West Africa UN Atomic Watchdog Chief Visits West Africa To Boost Nuclear Science For Health; Addressing a part of his mission that is perhaps as important as even if less headline-grabbing than the fight to prevent the spread of nuclear weapons, the head of the United Nations atomic watchdog agency is visiting West Africa see to how nuclear science can help in battling cancer, increasing crop yields and treating malaria. 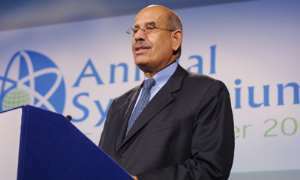 International Atomic Energy Agency (IAEA) Director-General Mohamed ElBaradei is now in Ghana where he will inaugurate a radiotherapy cancer treatment centre at Komfu Anokye Hospital in Kumasi. Prior to 1997 cancer patients in Ghana had few options for treatment. With IAEA assistance, comprehensive radiotherapy services were established in the capital, Accra, providing treatment to thousands. The new facility at Kumasi is already helping more Ghanaians, especially women, in their fight against diseases like cervical cancer. The Agency is working with Ghana on numerous other projects, including ways to use isotopes to bolster crop yields, improve human nutrition and detect drug resistance in malaria. During his two-day visit, Mr. ElBaradei will meet with President John Agyekum Kufuor, numerous Government ministers and officials of the Ghana Atomic Energy Commission.. He then leaves for Nigeria, which intends to set up, with IAEA assistance, an accelerator facility that will help to expand its technical capabilities in areas such as health and the environment, minerals development and oil research activities. Over the past four years the IAEA has provided the equivalent of more than $4.9 million in technical assistance to Nigeria. Projects primarily target human and animal health, agriculture, food quality and safety, ground water, research and education, nuclear industrial applications, radiation protection and regulatory control. A referral facility for radiotherapy, for example, was set up in the northern region of Nigeria to improve cancer care for patients. It is hoped to expand radiotherapy services in the southern part of the country. Mr. ElBaradei will meet with Nigerian President Olusegun Obasanjo, Government ministers, and officials of the Energy Commission of Nigeria and the Nigerian Nuclear Regulatory Authority.